By Lisa Buchman | February 1, 2019 View as "Clean Read"
In 1919, Woodrow Wilson was president, World War I had just ended, and Congress approved the right of women to vote. That same year, a group of charitable Austrian Jews sponsored the creation of a home for the aged in New Rochelle. In its first decade, the then “United Home for Aged Hebrews,” provided care for 51 elderly men and women in need at a two-story frame house, on three park-like acres on Pelham Road in New Rochelle. Now a nationally-recognized senior living community, United Hebrew of New Rochelle (as it is now known) celebrated its 100th anniversary at a joyous “Forever Young” birthday party, on January 30. The event, which was the kickoff of United Hebrew’s Centennial Celebration, took place at the original Pelham Road location, which has transformed from its modest beginnings into a modern 7.5 acre campus of comprehensive care, with 800 staff serving 1,000 residents and patients daily through a broad array of supportive care services. A standing-room-only crowd of distinguished guests, including County Executive George Latimer and New Rochelle Mayor Noam Bramson, gathered to congratulate United Hebrew and applaud the organization’s ongoing commitment to providing terrific, compassionate care for Westchester’s seniors and their families. 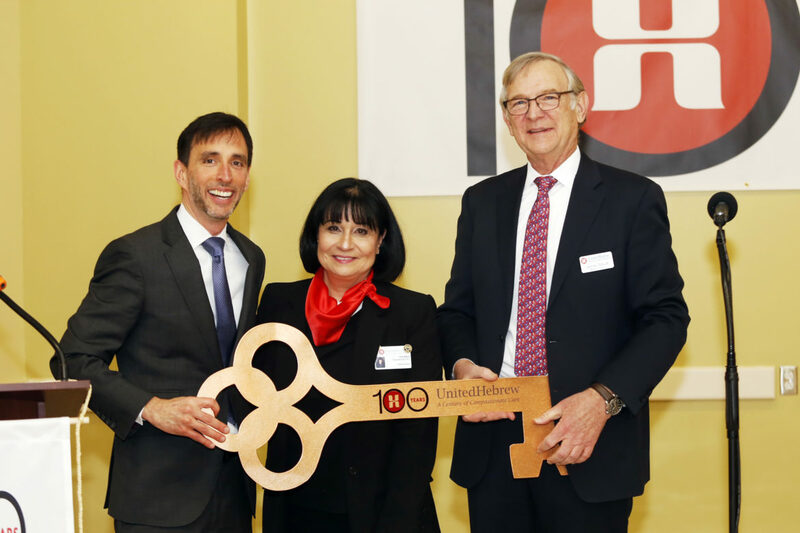 New Rochelle Mayor Noam Bramson honored United Hebrew with a symbolic “Key to the City,” recognizing Rita Mabli’s leadership and the organization’s contributions to the City of New Rochelle. “Year 100! It stops you in your tracks,” said Bramson.